I am writing my very first blog post while sitting at my kitchen table feeding my 7 month old baby food (which she hates) and my 2 year old is stamping herself with the stamp set that I Santa gave her for Christmas. --I know, I'm a genius! -- That is my life now and I love it! Why a blog? I graduated with a bachelor's degree in science and worked for 4 years before I started my little family and have never looked back. I stay home with my sweet girls and as a way to keep my sanity, I spend my "free" (term used very loosely) time crafting, creating, sewing and procuring new FABRIC (I have an addiction). I check in with all my favorite blogs daily and I've been thinking about starting a blog for awhile now....so here I am. I love to sew. Period. I got my very first sewing machine when I was 25, but didn't get the courage to open it until two years later and boy, am I glad I did! I taught myself how to sew in 2009 and then needed a new challenge while pregnant with little relish #2....so I taught myself how to quilt in 2012. 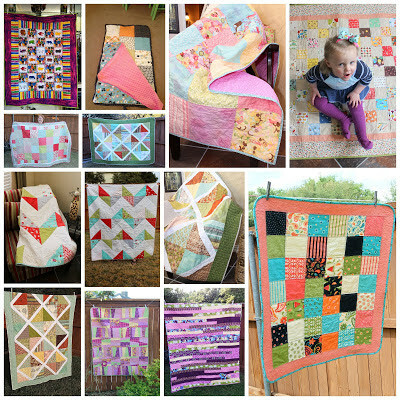 Almost everything I have learned about sewing or quilting I learned from blogs (or the books my favorite bloggers have written). I feel like I am so behind with sharing all my sewing projects, so I have created a modpodge of my quilts from 2012. The Brown Bear, Brown Bear, What do you See? was my very first quilt. Hopefully, I will get a chance to tell you about some of them in detail later. Thanks so much for reading and please feel free to leave a comment! This is very interesting ideal and really helpful information. Also try our new Nursery Embroidery Designs Thanks!